"We just threw out first Murder Mystery Party here as a birthday shindig! We did A Heroic Death and of course did it very spur of the moment, giving our participants only 2 days notice! Add to that that we did the party on a week/work/school night (we are a mixture of your professionals and graduate students at Virginia Tech). But boy, did our friends come through! We had a former D&D Dungeon Master playing our host and everyone came in full costume!! "Thank you for providing these games! This is the second one I've hosted from your site and, as before, everyone had a blast and was wanting to know when the next one would be. I am definitely a repeat customer! I started planning A Heroic Death the moment I heard about it in your email newsletter. The game was VERY well written with some wildly funny superhero cliches (I won't elaborate in case of spoilers!)." "Hosted the A Heroic Death (Kids) Murder Mystery game last weekend at our chalet north of Toronto Canada. The temperature outside dropped to an incredible minus 30 Celsius, so it was a perfect time to stay inside (except for the Ice Queen). Our family of 4 hosted 2 other families so we had 6 Adults and 6 kids from the age of 9 to 12. 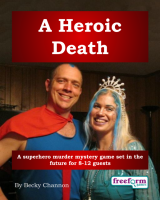 The two invited families had never played a murder mystery game, but I knew they all secretly wanted to be superheroes, so A Heroic Death was perfect. I was pleasantly surprised by the effort they put into costumes by the group. We played the game in about 2.5 hours, and spent over an hour debriefing. Everybody loved it and kept talking about the various characters for hours afterwards, and even the majority of the next day. The newbies are all keen to do another game now that they understand how they work - so we will probably do something in the summer." "Yesterday was a blast! I just wanted to let you guys know that everyone LOVED A Heroic Death. Everyone was new to the world of murder mystery games so maybe I should have picked an easier plot for an all-first-timer-team but it was fantastic nonetheless!! All the characters arrived in wonderful costumes (all home-made and creative) and even though there was some confusion here and there, it was just superb!! Some characters got a little side-tracked and got so engaged in blackmailing and bargaining that at the end of the game they had no clue whatsoever who the killer might have been. :))) I hadn't laughed this much in a long time, so thank you!! " "A Heroic Death played out beautifully! I had a group that went all out. I had to give a little direction near the beginning, but they got the hang of it quickly. We are excited to try another game next month!" "As always, we loved A Heroic Death!" A Heroic Death is a dinner party murder mystery game for 8 to 12 guests and a host – download the free introductory pdf file. Kids' version – this game includes a FREE special version written for kids and younger teens. Join us in a heroic evening of crime-fighting, superpowers and Noble Justice! You will be in the middle of the action and it will be up to you to wheel and deal with the other guests. Can you achieve your goals, keep your secrets hidden and survive A Heroic Death? It's up to you. The world is in jeopardy. As usual. And as usual, it's up to the SuperHeroicJusticeDoomSquad to save the day. The problem is that they all had a big party last night celebrating something exciting that they can't quite remember; and this morning, their manager Bernard was found dead on the lovely faux-sheepskin rug in their Lounge. Their secret base, the location of this party, has impenetrable defences (being inside a giant dormant volcano, naturally) and it was locked shut all night – so they have come to the realization that the killer must have been one of the Squad… or possibly their cleaner, Miguel. The big red 'World in Danger!' light is flashing in the control room, so they really need to get out there and defeat the bad guys, but there's another problem. Bernard was the only one who had the access code to the main computer which controls everything, and it somehow got logged out last night. Now the Heroes can neither speak to the outside world to find out what crisis is going on this time, nor can they turn off the SuperHeroicSuperiorAlarmSystems alarm and leave the base. The outside door (which is controlled by the main computer) is locked shut until the alarm system can be reset, and it has been specially made to withstand anything. Our heroes need to find a way to get out of the base in time to save the world – and find out which of them is a murderer, and why – before it's too late! A Heroic Death lasts for about four hours and is suited to an evening. It is often played over a meal – a finger buffet if possible to allow guests to circulate and talk in private. "So glad we picked this story, we definitely got our money's worth! Everyone had a blast with A Heroic Death and was impressed with all the plot twists, character backstory and abilities. Can't wait to host another event!" The free introductory pdf file contains an introduction to the game, a cast list of all the characters, and a copy of the CityVille Post – plus details of how to buy the game. Bloody Mary – Bloody Mary likes fighting villains and drinking cocktails, and is known for her potions. Captain Amazing! – Charismatic and photogenic, Captain Amazing! founded the SuperHeroicJusticeDoomSquad. Dr Robot-Neck – The squad�s second in command and its brains. Ice Queen – The proud and haughty Ice Queen appears to be made entirely of ice. InvisoGirl – Unusually shy, InvisoGirl is known for her mischievous sense of humour. Puss-in-Boots – A talking cat that wears clothes and walks on its hind legs. S. – The squad's newest member, S. only joined yesterday and really likes snakes. Shaman – Once a librarian, Shaman is possessed by the spirit of a powerful Native American shaman. The Masked Crusader – Rejoined the squad a month ago following five years of fighting crime in South America. The Russian – A mysterious superhero with a French accent and impressive references from Paris. WhizzoGirl – WhizzoGirl often acts as the Squad's spokesperson and media liaison. A Heroic Death is unlike many murder mystery games. Although the game starts with a murder, some of the characters have more important things to do than to investigate it. And the killing may not be over – it's not certain that everyone will survive the remainder of the evening! A Heroic Death is played just like a murder mystery game. You may be trying to solve the murder, but primarily you are (initially at least) concentrating on your own goals and objectives. Unlike most boxed murder mystery games, A Heroic Death lets you decide how to achieve your goals and thwart your enemies. On the evening of the game the guests are met by the organizer, the HOST, and welcomed to the secret base. They then receive their detailed backgrounds – including dark secrets, objectives and money. The fun then begins as they form alliances, blackmail each other, steal items and maybe even try to murder one another! Depending on what the players choose to do, there are several different possible endings, but finally everyone finds out how they did, and what secrets everyone else was concealing. A Heroic Death costs £20.00 (GB pounds) or US $29.99. You can buy it in either currency, from anywhere in the world, as you prefer. The price will be converted back into your own currency for you, at today's exchange rate. We offer a Cast Iron Guarantee on all our murder mystery games. If you're not completely satisfied with A Heroic Death then please let us know within 30 days and we will refund you. See our full terms and conditions here.